This month in our trip around the food world, we’re taking a look at an unincorporated territory of the United States; the beautiful Caribbean island of Puerto Rico. Two spice blends feature big in Puerto Rican food – adobo (peppercorns, garlic, salt, olive oil, lime juice and oregano) and sofrito (sauted peppers, garlic, onions and coriander with achiote (which are annatoo seeds) and this gives the vibrant gold colour to many of the island’s dishes. 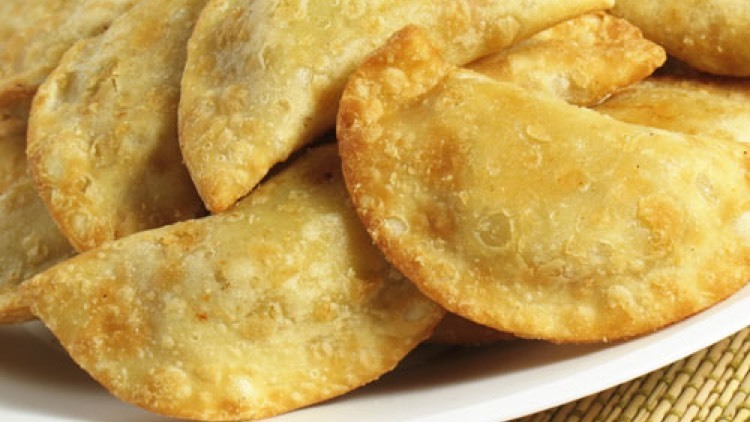 Empanadillas – crescent-shaped turnovers filled with lobster, crab, conch, or beef. Lechón asado – barbecued pork. The meat is often basted with jugo de naranjas agría (sour orange juice) and achiote coloring and served with peeled green plantains, which are roasted. The traditional dressing for lechon asado is ali-li-monjili – a sour garlic sauce made with whole peppercorns, sweet chillies, olive oil, vinegar, and lime. Puerto Ricans cook a lot of chicken and one of the most popular dishes is arroz con pollo (chicken with rice).Fish and shellfish are popular, often served grilled with a dressing of garlic and lime juice. Camarones en cerveza – shrimps cooked in beer – is an unexpected but tasty combination. Asopao – a hearty gumbo made with either chicken or shellfish. Recipes vary but this dish is usually flavoured with paprika, oregano and garlic plus ham, chorizo, chilli, onions, fresh coriander, tomatoes and peppers. Tostones, although often made from breadfruit, can also be made from plantains. A favourite shared amongst many Caribbean islands.